I spend most of my week living in dresses & tights, so am pretty much always on the lookout for nice dresses that suit both work & fun. I stumbled across this dress a little while ago, didn't really think it was my sort of thing, but tried it on & was surprised by just how much I loved it! It's a lovely jersey fabric, so will be light enough for summer, has sleeves (hooray for sleeves) and is a super flattering fit. Even just a year ago I don't think I would have been brave enough to wear a mega flowery dress, but one of the benefits of blogging is that you really start to embrace bright fabrics! It sits just below my knee, so is again a wee bit out of my comfort zone (I'm a shorty, so longer dresses can drown me) but I think it works quite well! 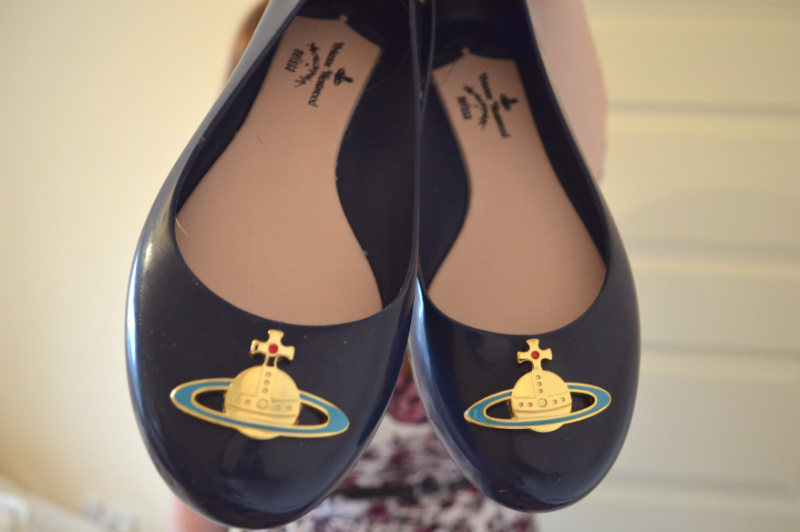 I'm pairing it with dark navy tights and my beautiful new Vivienne Westwood shoes - how lovely are these?! They are from the Melissa range, which means they are made out of rubber that smells like bubblegum (kind of weird, I know). I was worried that they wouldn't be comfortable (rubber shoes sounded a bit painful to me) but they are actually brilliant! That dress is so pretty, both the print and the cut. 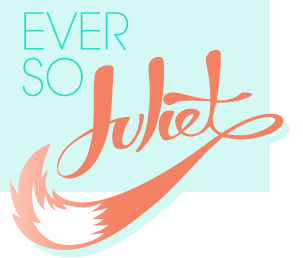 I'm really pleased with it! It's a shame it's no longer on their website... might have to have a look in the shop to see if it comes in any other fabrics. Love it! 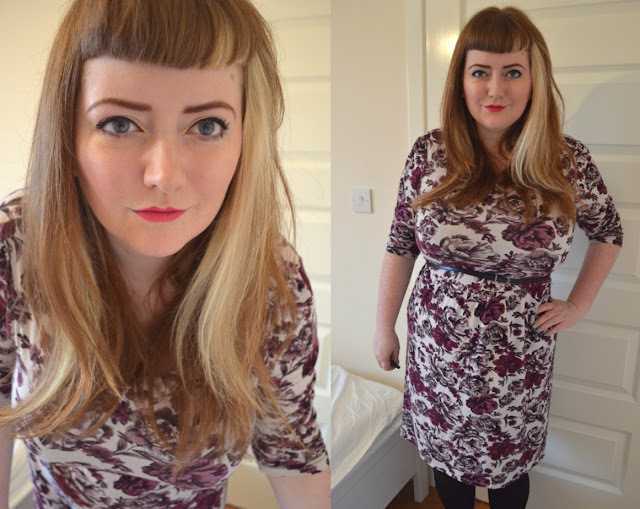 Strangely enough, blogging has totally made me more adventurous in how I dress. Don't know how that works, but it's fine by me. And I'm gonna drool over your Vivienne Westwood shoes for a bit :D Rubber? SCENTED rubber? Yeah, I think it might be seeing some of the mental things fashion bloggers wear, that makes me braver with more 'normal' prints, ha! 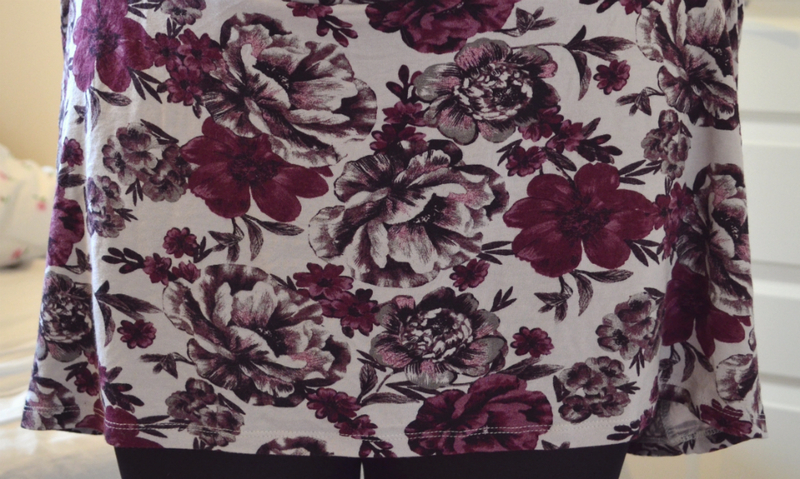 I love that it's jersey and that despite being floral it's still gorgeous dark colours which are great for work or the colder months! I love the shoes! I have a VW Melissa pair of heels and I'm trying to keep them for good as they're so pretty. So pretty! And i'm not normally a shoe person, but i may be experiencing some serious lust over these. You look stunning. Your hair is always so perfect. Jealous. Love the Vivian Westwoods. Wow your style is amazing. I love your dress so much, it looks so stylish. Those shoes are fab too!